Click here to read more about me and my blog! These regular-mouth pint jars are ideal for pickles. Click below for the wide-mouth version. I use this every time I fill a jar for canning, storage, or gift mixes. It makes the task easy, tidy, and fast. Dual spouts and a long, hooked handle take the mess out of filling canning jars. 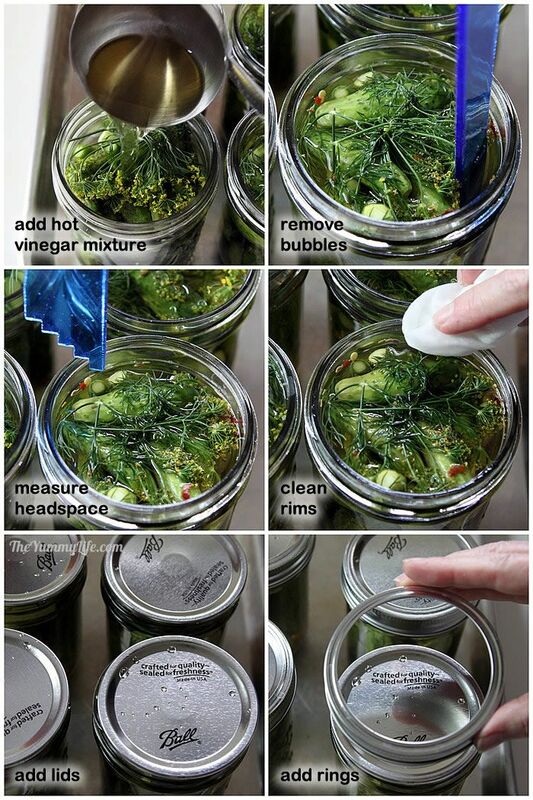 Use this tool to remove bubbles and measure headspace before sealing jars. Use this to safely transfer jars vertically in and out of boiling water. These full size sheets work with ink-jet printers. Print a sheet of labels, cut them apart, and adhere them to jars for a polished finishing touch. This punches perfect circles just the right size for cutting the gift tags & jar labels in one quick, easy motion. 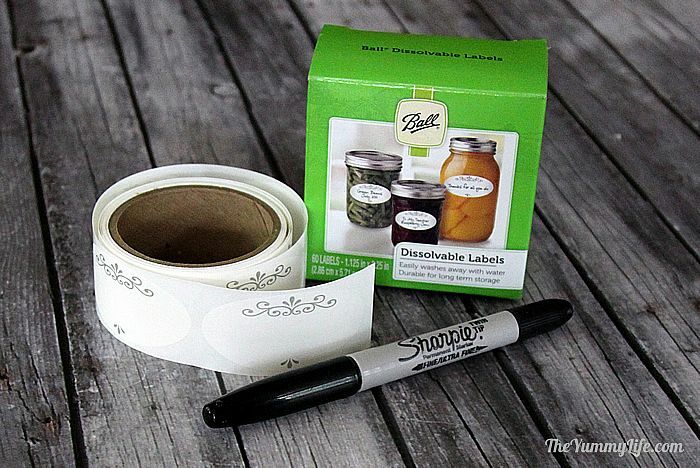 These write-on labels are a quick and easy way to label your jars. The labels easily wash off of emptied jars. 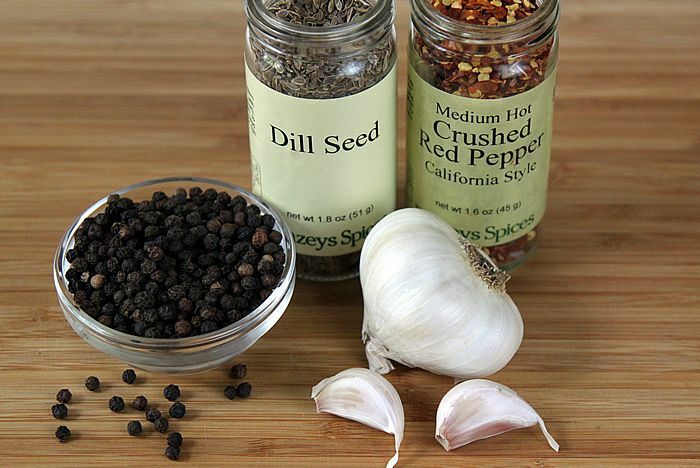 For an easy way to achieve crispier pickles, simply add 1/8 teaspoon of this to each jar. This salt is recommended for pickles because it is pure and without additives. Wash cucumbers well. Slice 1/8 inch" off both stem and blossom end. Small cucumbers may be left whole. Larger cucumbers may be sliced into 1/4" rounds; or they may be quartered lengthwise into spears, making sure they are shorter than the jars. Add vinegar, water, salt, and sugar to medium saucepan. Bring to boil over high heat, stirring until salt and sugar are dissolved. Lower heat and cover until ready to use. Add cucumbers, packing them as compactly as possible without crushing them. Add dill sprig/head on top. Ladle hot vinegar mixture into jars, leaving 1/4" headspace. Place chopstick or bubble remover tool down side of jar and pull towards center to remove bubbles; refill jars with additional liquid, if necessary. Clean jar rims with wet paper towel. Add lids and screw on rings just until finger tight. For refrigerator pickles, place jars in refrigerator and allow to marinate at least 3 weeks for the best flavor. They will be good for several months. Process jars in boiling water canner for 10 minutes. Remove canner lid and turn off heat, leaving jars in hot water for 5 minutes. Remove jars and rest on towel, undisturbed for 12 hours. For the best flavor, allow pickles to stand for 4-6 weeks before eating. Store jars in cool, dark place. They are shelf stable for at least 1 year. I recently shared my recipe for my grandma's old-fashioned Bread and Butter Pickles. Turns out that dill pickles also have a long history in my family; but this time the tradition comes from King-Man's side of the family. 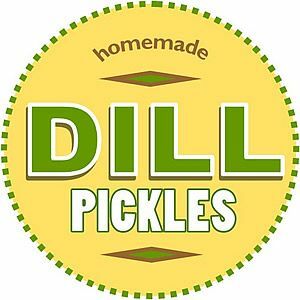 I'm sharing this dill pickle recipe in memory of my late father-in-law, Al. He was a hard-working, salt-of-the-earth, Wisconsin dairy farmer and an adorable man. Not only did Al work long days on the farm, but he also could cook up a storm in the kitchen--quite unusual for a farmer of his generation. 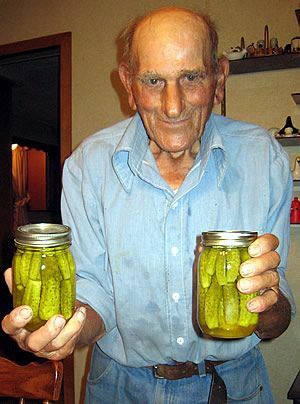 After his wife, Marie, passed away, Al continued the tradition they'd shared of canning jam and dill pickles. He had a big, beautiful garden where he grew his own pickling cucumbers. Al always picked the cucumbers when they were small, many of them tiny little bite-sized guys. Those teensy pickles were the ones most prized by those of us in his family who lined up for our share of Al's jars of pickles every year. Since we'd always gotten our dill pickles from Al and Marie, I'd never bothered to make my own. But, after Al passed away at the age of 92, I decided I'd better start making dill pickles for King-Man and our family. 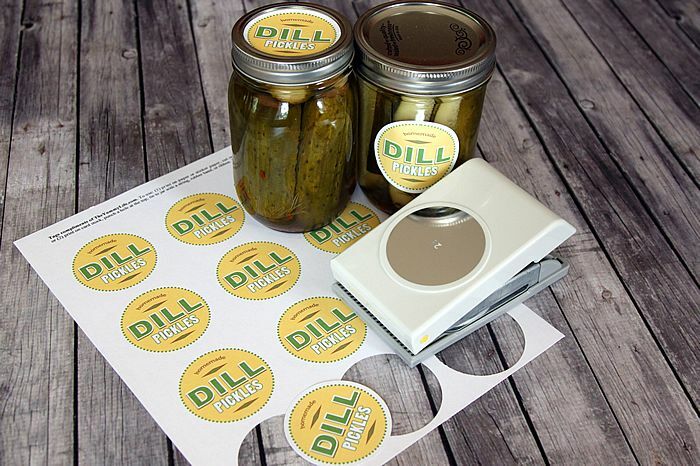 Not only do we love dill pickles, but they are also a sentimental connection to Al and the many happy memories we have of him. I think of that sweet man every time I make or eat dill pickles. Although we are partial to the teensy little pickles like Al made, those tiny cukes are hard to come by. It takes a big garden with lots of cucumber plants to produce enough mini cukes to fill multiple jars, and it's virtually impossible to buy them that small. So I usually end up making dill pickles in a variety of shapes and sizes. This recipe works for them all. Fast and easy. Dill pickles are surprisingly easy to make. I made a few batches before I found the combination of ingredients that were the right balance of tangy, salty, garlicky, dilly and with just a touch of heat. These are especially fast to prep as a refrigerator pickle. If you want them to be shelf stable for an extended time, this recipe is also suitable for canning. Refrigerator pickled peppers -- Simply assemble the jars and refrigerate them. After marinating in the fridge for a few weeks, they're ready to eat. They'll be good stored in the fridge for several months. Canned pickled peppers -- This recipe is suitable and safe for water-process canning. That means they'll be shelf-stable for at least 1 year. This is my preferred option for making a larger quantity at one time. 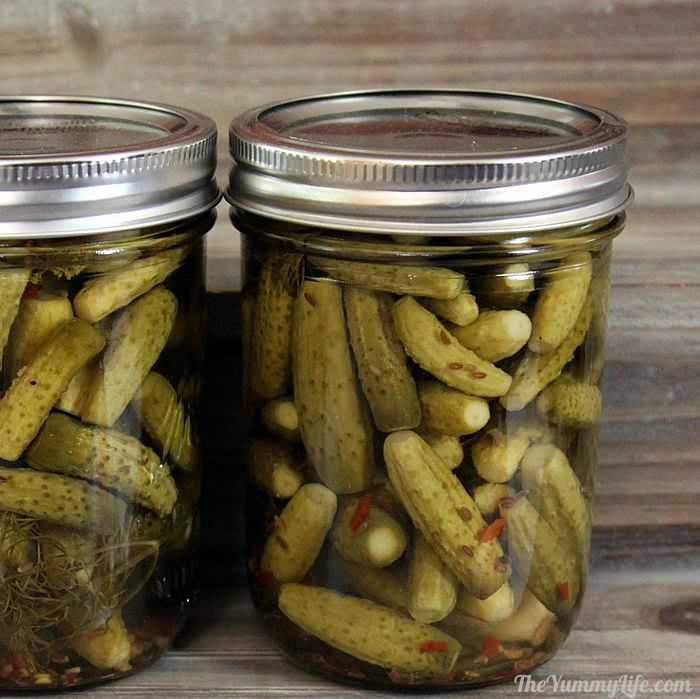 Canned pickles may be stored in a dark pantry so they don't take up a lot of fridge space. If you're new to canning, see my post: Step-by-step Canning Tips. Printable labels, too. 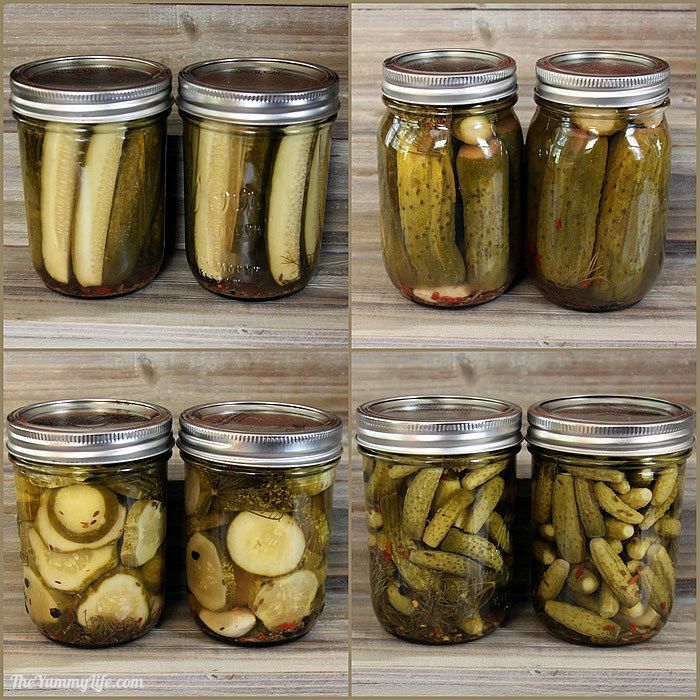 Canned goods make a great gift to have on hand, and most everyone loves pickles. I've provided printable labels near the end of this post that transform your jars into distinctive gifts. Make them now to have ready for holiday, hostess, teacher, and friend gift-giving. There's nothing more appreciated than a homemade gift. 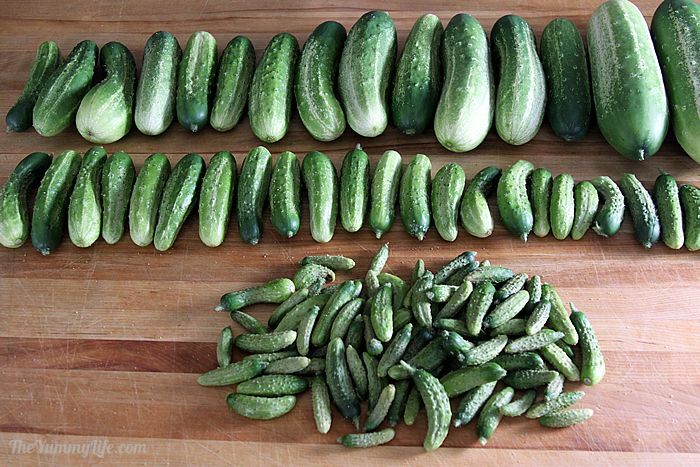 Pickling cucumbers--If you don't grow your own, Farmer's Markets are the best places to find fresh pickling cucumbers. If you buy yours at the grocery store, avoid the ones that have a thick, waxed skin. I harvested the cukes below from my garden. I ended up with enough tiny cukes to make 2 pint jars of pickles, and I used larger cucumbers for additional jars. I first sorted them by size. The smaller ones are easy to can whole, but the larger ones needed to be cut into spears or rounds (coins). Although you can mix shapes and sizes in one jar, I prefer to have jars of uniform shapes and sizes in mine--just a personal preference thing. Cider vinegar--You can also use white vinegar or a combination of the two. sugar or honey (optional) -- I like to add just a little bit of sweetness to balance the tartness of the vinegar. You can omit it, if you prefer. Step 2. Wash the cucumbers well and then cut an 1/8" smidgeon off of both ends. Step 3. 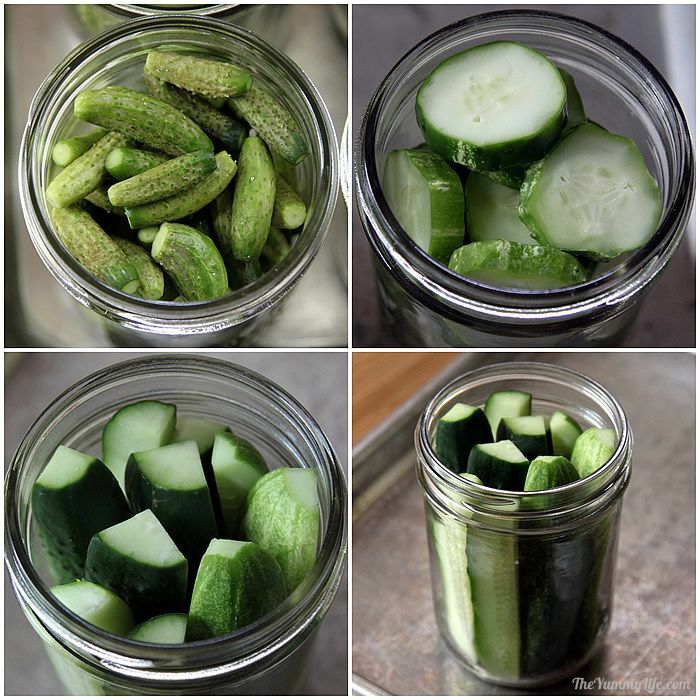 If cucumbers are too large to fit in the jars whole, cut them into 1/4" coins or quarter them lengthwise into spears. Step 4. 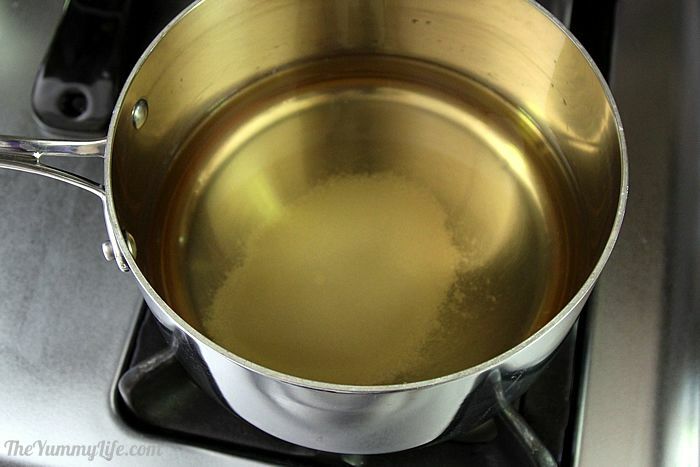 Combine the vinegar, salt, and sugar with water in a saucepan. Bring it to a boil and cook until the salt and sugar is dissolved. Cover and keep it warm on low. Below are step-by-step photos that explain how to assemble jars of pickles and can them. If you are making refrigerator pickles, simply assemble the jars as described and refrigerate them, skipping the water process canning. Adhere to canning safety guidelines. It's important to follow the jar preparation and processing recommended by the USDA. If you want more detailed canning information, I recommend the Ball website. They are the ultimate authority, and their site is loaded with detailed information and recipes suited for canning. Step 5. Prepare the jars & lids. I use pint jars for pickles. Wash the jars in hot sudsy water, rinse and dry them. The jars don't have to be sterilized, since they will be processed for 10 minutes (as per updated canning guidelines from Ball). The washed jars need to be hot when they're filled with the hot vinegar mixture. Keep the jars hot in the canner filled with simmering water. Or, my preference is to put them on a tray in an 180 degree oven to keep them hot until it's time to fill them. I think that's easier that juggling them in and out of hot water right before filling them. The lids and rings should be washed in hot sudsy water, rinsed and dried. The lids do not have to be kept hot in simmering water according to current canning guidelines. Step 6. Add seasonings to each jar. If using Pickle Crisp (optional), add 1/8 teaspoon to the bottom of each jar. 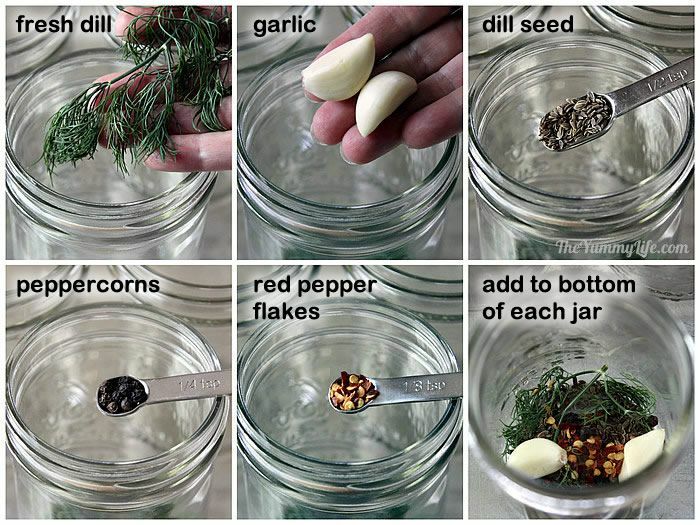 Next add to each jar: fresh dill, garlic, dill seed, peppercorns, and crushed red pepper flakes. Step 7. Add prepared cucumbers to each jar as compactly as possible without crushing them. I insert a chopstick into the jar to rearrange the cucumbers and eliminate gaps between them. TIP: If your cucumbers are cut into rounds, stagger them in different directions so they don't stack on top of each other (like a stack of coins). This will give your jars a better appearance and insure that the vinegar solution better surrounds the individual slices. Step 8. 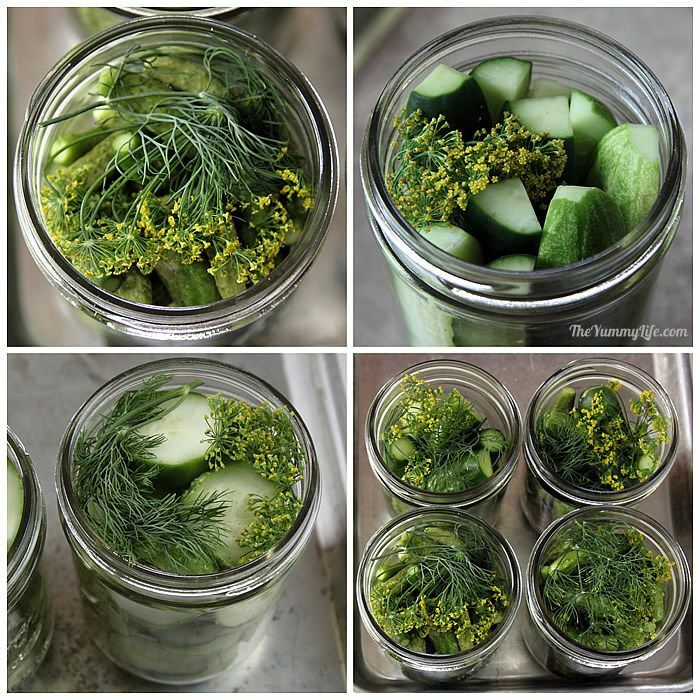 Add another sprig of fresh dill on top of the cucumbers in the jar. Step 9. Ladle the hot vinegar mixture into the jars, filling them until there is 1/4" headspace. Step 10. Insert a bubble remover down the side of the jar and pull toward the center to release any bubbles (you can use any long, thin object like a chopstick). Step 11. Measure headspace and add more hot vinegar mixture to restore 1/4" headspace, if necessary. Step 12. Clean jar rims thoroughly with a wet paper towel. If the rims are dirty the jars won't seal. Step 13. Add a lid to each jar. Screw on a ring until it is "finger tight". For refrigerator pickles, you're done! Let the jars cool to room temperature, then put them in the fridge and let them marinate for 3 or more weeks before eating them. They will keep in the fridge for several months. Step 14. While you're preparing the cucumbers and filling the jars, get your water boiling. 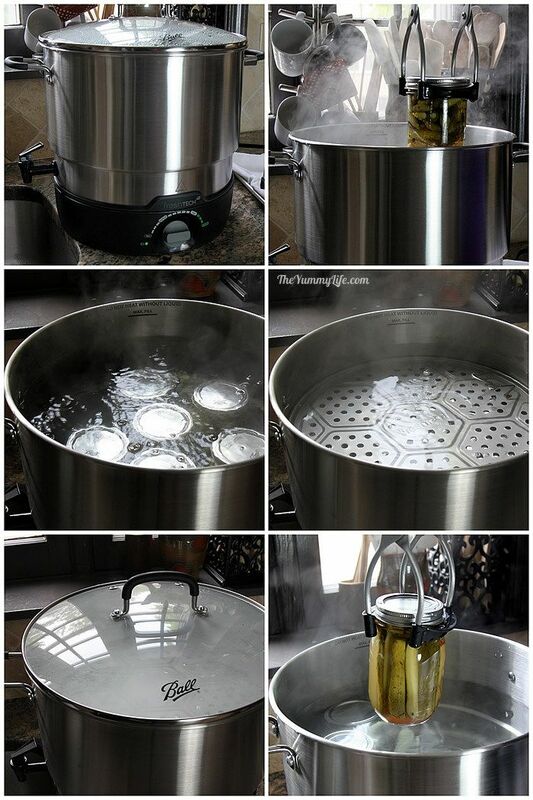 Add water to a water-process canner or large pot (with a rack in the bottom) that is tall enough for the water level to be 1" higher than the jars. Bring water to a boil, cover, and keep hot until jars are ready. Step 16. Use a jar lifter to remove each jar vertically and set on a towel. Leave undisturbed for 12 hours. Within 30 minutes after the jars are removed from the water, you know they've safely sealed if the center of the jar is slightly indented (it shouldn't give when you press it); often you'll hear a popping noise when they seal. If any of your jars don't seal, store them in the fridge and eat them within 2-3 months. 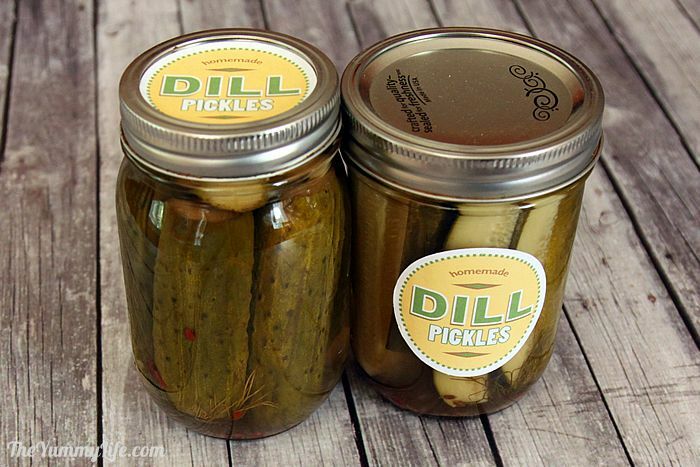 For the best flavor, allow canned pickles to stand for 4-6 weeks before opening and eating. Store your sealed, processed jars in a cool, dark place (a cabinet or pantry is fine as long as it doesn't get too hot); a basement is ideal. The are shelf stable for at least 1 year. For a finishing touch, I like to label my jars. That way they're easy to identify on my shelf, look attractive on the table, and are ready for gift giving, too. Pickles are universally loved and fun to share. Going to a party? Grab one of these to take as a perfect host/hostess gift. Need a little something for a teacher, co-worker, or neighbor? You can't go wrong with a jar of pickles. Print the labels and stick them on the sides or lids of each jar--easy! Download printable jar labels/tags. These are sized to fit on jar lids (regular or wide mouth) or sides. Print them on sticker paper and stick them to the jar or lid. (This is what I do.) Or, print them on regular paper and stick them on with tape. Click on the label image below to download & print a full sheet of labels/tags. Cut with scissors or a circle punch. You can cut the round tags out carefully with scissors, or use a circle punch to make the task easier and more precise. I use a 2-1/4" circle punch; it fits both regular and wide canning lids. Write-on labels are an easy option if you don't want to go to the trouble of printing and cutting your own. These ready-made rolls of labels are sized just right for canning jars and they are dissolvable for easy removal when the jar is empty. These crispy, flavorful pickles are a must with burgers, brats, and sandwiches. We still are partial to the teensy, bite-sized ones--those were Al's trademark pickles. One bite takes me back to his country kitchen. Al was one-of-a-kind, and so were his dill pickles. Make it a Yummy day!